Co-sponsored with the Psychology Department, our department’s annualUndergraduate Research Poster Session will be held 12:15-1:30 p.m. on Friday, April 30th. If you have research you have done either this semester or last fall that would lend itself to a visual presentation, please consider presenting your work. In some classes, extra credit may be earned this way, but in any case it’s a great thing to be able to put on your resume. Further details are available at the poster session webpage, where you can also sign up to make a poster presentation. Please do so no later than Friday, April 23rd. All majors and minors, whether or not they are presenting, are invited to attend this end-of-the-semester event. Click below to see pictures from previous years’ events. The Online Syllabi web page at the departmental web site contains links to more than forty course web sites in the department, and offers a great way to explore course offerings for the Spring Semester. All Sociology and CJ majors should take Methods and Techniques of Social Research (920:301) in the Fall semester if they have not already taken it. This course is a prerequisite for a number of upper-level courses, and knowledge of MicroCase and the basics of data analysis are increasingly expected in all upper-level courses. Note: the methods course also fulfills the second math requirement in the CCAS curriculum. Sociological Theory is offered only in the fall. If you expect to graduate in Spring 2005, you must take Sociological Theory in the fall if you haven’t already completed it. Co-sponsored with the Psychology Department, Sociology’s Service Learning course on “Bridging the Digital Divide in Camden” will continue to combine a Wednesday late afternoon seminar with 5-6 hours of fieldwork at Camden community centers and schools. The Summer School schedule for courses in Sociology, Anthropology and Criminal Justice is available online. Named after the founder and first chair of our department, theGeorge Masterton Award is awarded each year for outstanding academic achievement and participation in the life of the department. This year the award is being given to Kelly Gerber (Criminal Justice) and Kristi Napoleon (Sociology). Congratulations and best wishes to both! Dr. Jon’a Meyer again led a group of Rutgers-Camden criminal justice students, along with several honorary members of the delegation, on a tour of criminal justice institutions and facilities in South Africa and Namibia in March over spring break. Click here for a detailed trip description. If you know what the “gizmos” are on the left, chances are that you’re taking either Jon’a Meyer’s Theories of Crime and Delinquency or Monika Wood’s Sociology of Aging course. Both instructors are experimenting with a wireless student response system from e-instruction. The response pads enable instant feedback to the instructor that is then represented in graphical form, viewable by all. This and several other innovations are being supported by a teaching grant from the Office of the Vice-President for Undergraduate Education. Other components of the grant involve the creation of new online streaming tutorials by Profs. Wood and Meyer (check out the Online Tutorials and Videos web page at the department web site for the latest additions); and several new uses of WebCT by Prof. Goertzel, including the electronic submission and immediate grading of MicroCase exercises in his Methods and Techniques of Social Research course. 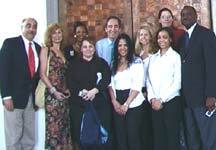 These innovations were shared with 25 other faculty and staff at a workshop on April 2, 2004. In case you haven’t noticed, our department web site has a new look and a slightly-modified navigation structure that makes moving around easier. The web site continues to be regularly updated and expanded. If you’re a sociology or criminal justice major and are not already familiar with it, you should check out our department’s Web-Enhanced Curriculum site, which offers a variety of resources to support student work in courses across the department’s curriculum. The departmental web site is organized around its Departmental Homepageand its Web-Enhanced Curriculum Homepage, as outlined below. If you have Windows Media Player 9 (available on all campus lab computers), you may watch and listen to a“screen movie” tour of the web site (you’ll need to bring your own headphones if you use the lab). Several methods and MicroCase-related tutorials have been added to the Online Research Tutorials and Videos web page, along with a streaming video by Dr. Coe on“Turning an Event into Field notes: A Ghanaian Example.” The Department’s Web-Enhanced Curriculum was an important factor in its receipt of the university’s Programmatic Excellence Award this year. Check it out! It’s there for you to use! Comments and suggestions welcome. MicroCase tutor/graders are needed for several courses in the fall. Independent study credit may be earned for doing this. Interested students should have completed the Methods and Techniques course with at least a B. Contact Dr. Wood if you would like further details. Several data analysis and MicroCase streaming tutorials have been added to theMicroCase Resources web page. October 30, 2004 . Contact Robert Wood with comments or questions. Page last updated by Sociology, Anthropology & Criminal Justice at 8:11 pm August 9, 2017 . This page was printed from http://sociology.camden.rutgers.edu/news/newsletter/spring-2004-newsletter/ at 10:36 PM Thursday, April 25, 2019.